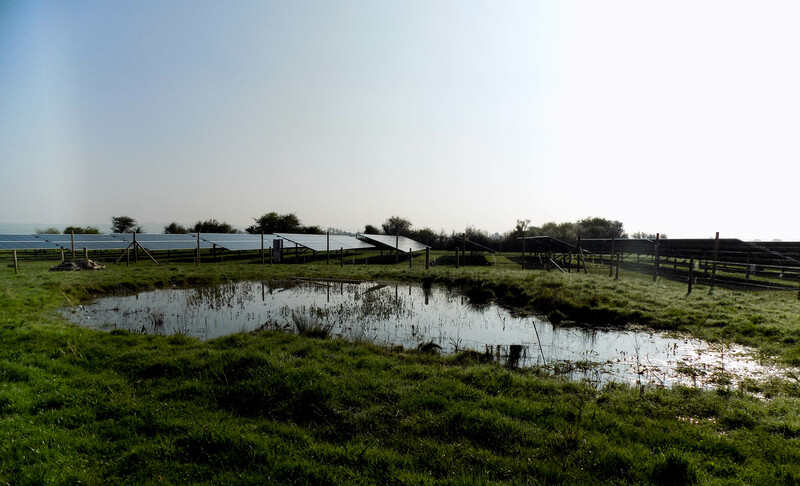 BSG Ecology was commissioned in 2014 by Hadstone Energy to provide ecological support with regard to a proposed 19 MW solar site at Wick Farm, on the Somerset Levels. 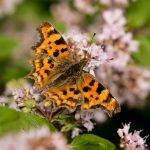 Initial work involved desk study and an extended Phase 1 habitat survey. This resulted in the identification of several ponds with the potential to support great crested newts within the Site boundary. A great crested newt survey of these ponds was subsequently undertaken and a small population was found to be present. The development was granted planning permission in 2014. 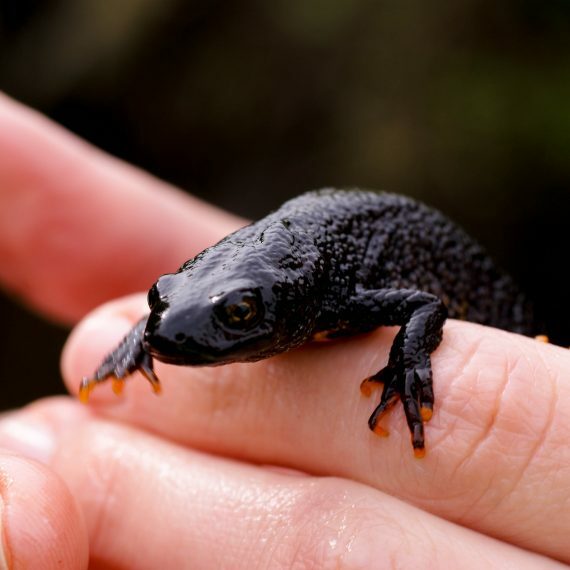 To enable the construction of the Site, a European Protected Species (mitigation) licence (EPS licence) for great crested newt was required, and an Ecological Management Plan (EMP) for the Site covering the 25 year operational life of the development was needed (the latter was a condition of the consent). The approach to securing an EPS licence was complicated by the local landscape: each field within the Site is bounded on all sides by large drainage ditches (rhynes) typical of the Somerset Levels. The rhynes prevented a straightforward approach to trapping and exclusion of GCN from the works area, as amphibian fence lines cannot cross flowing water. 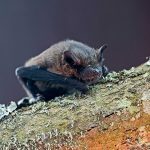 The presence of a further protected species, water vole, within the rhyne network, and local byelaws preventing the erection of structures that could prevent maintenance access within the curtilage of the rhynes presented a further challenge. To overcome these issues, a great crested newt mitigation strategy was devised in consultation with Hadstone that included a working method for areas which it was not possible to fence off. In these small areas outside of the newt fencing, hand searches were undertaken immediately ahead of construction to avoid killing or injury of newts. 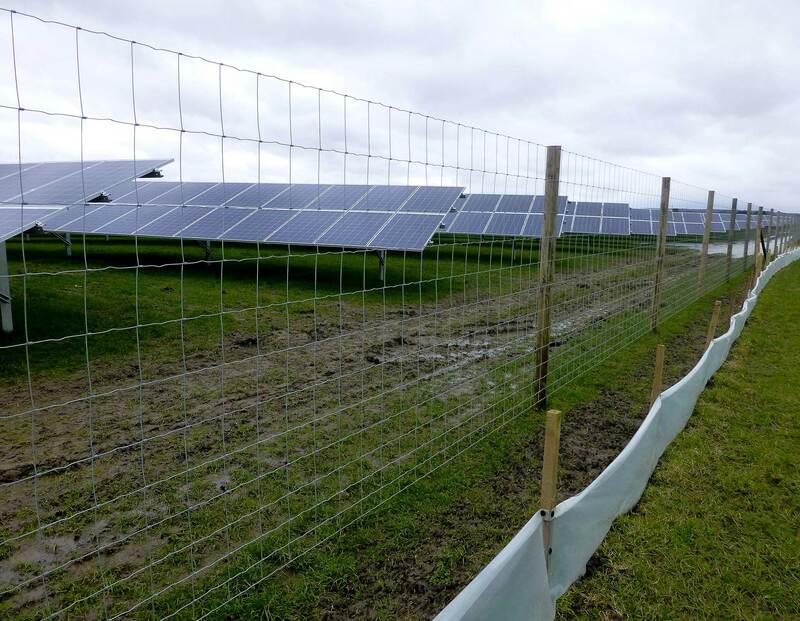 We secured the EPS licence without significant complication in September 2015, and subsequently supervised the installation of amphibian fencing, and oversaw the clearance of GCN from the Site over a period of six weeks. The landowners were provided with a toolbox talk and rigorous training by an experienced BSG Ecology herpetologist to enable them to undertake the trapping out of GCN from pitfall traps to the required animal welfare standards (they acted as assistants under the licence with BSG Ecology’s supervision). As a result, we were able to pass on considerable cost savings. 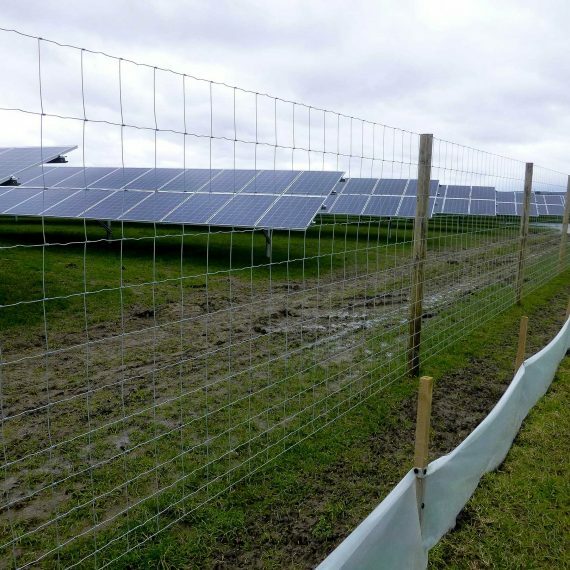 The EMP included habitat enhancement and creation prescriptions for grassland, hedgerows, ponds and rhynes to be delivered over the 25 year operational life of the solar farm. 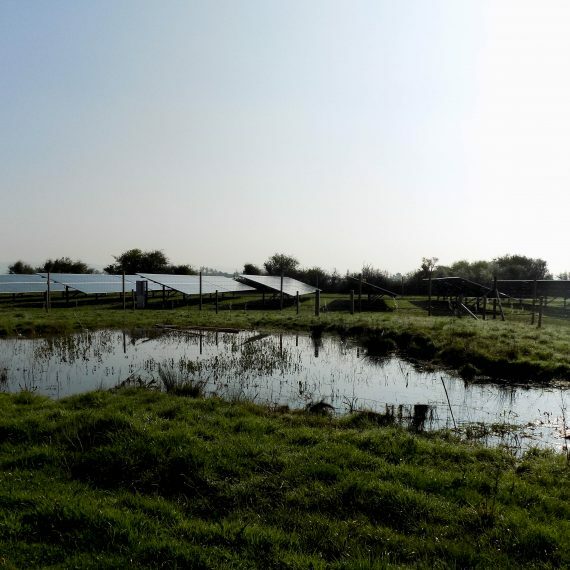 The management plan was prepared in such a way as to facilitate the farmers continued use of the land under the solar panels for rearing livestock while simultaneously providing a net gain for wildlife within the Site. The EMP was accepted by the local planners and statutory consultees without comment. 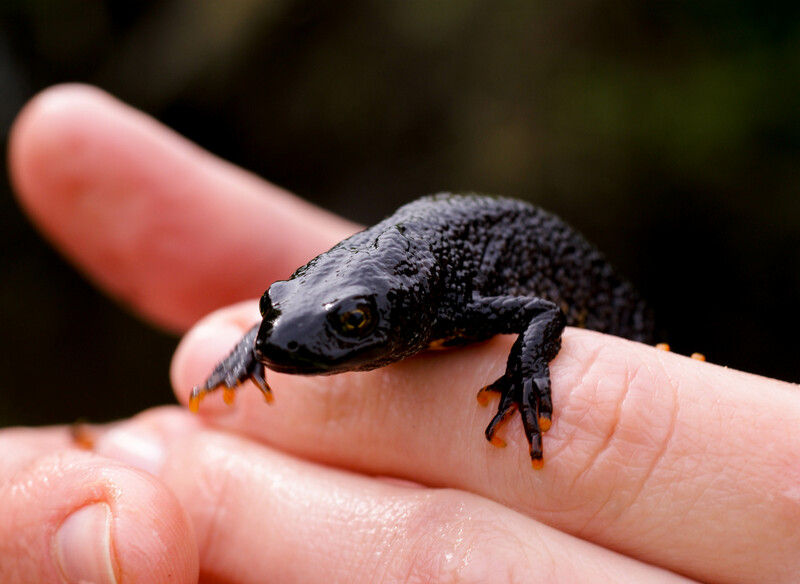 Following the successful discharge of the planning conditions, BSG Ecology was retained to deliver the great crested newt licence implementation work during the construction of the Site. The Site is now owned by Gamma Energy.